I’ve gone down the rabbit hole of playing with modular synthesizers and I’m never going back. The immediate, tactile response of plugging modules together, turning a knob, and hearing the sound bring a sense of calm over me. No joke. I started with a few modules in the winter of 2017. I was working on a really stressful show and I discovered that coming home late at night, putting on headphones, and listening to really simple drones and ambient tones that I could quickly create brought my stress level down immediately. As time progressed and money allowed, I started buying more modules, doing extensive research into which module would be best suited for the sorts of sounds I was seeking. The first video I made of me playing my synthesizer, posted on Instagram back in January of 2018. Not terribly pleasing to listen to, but it’s a start! 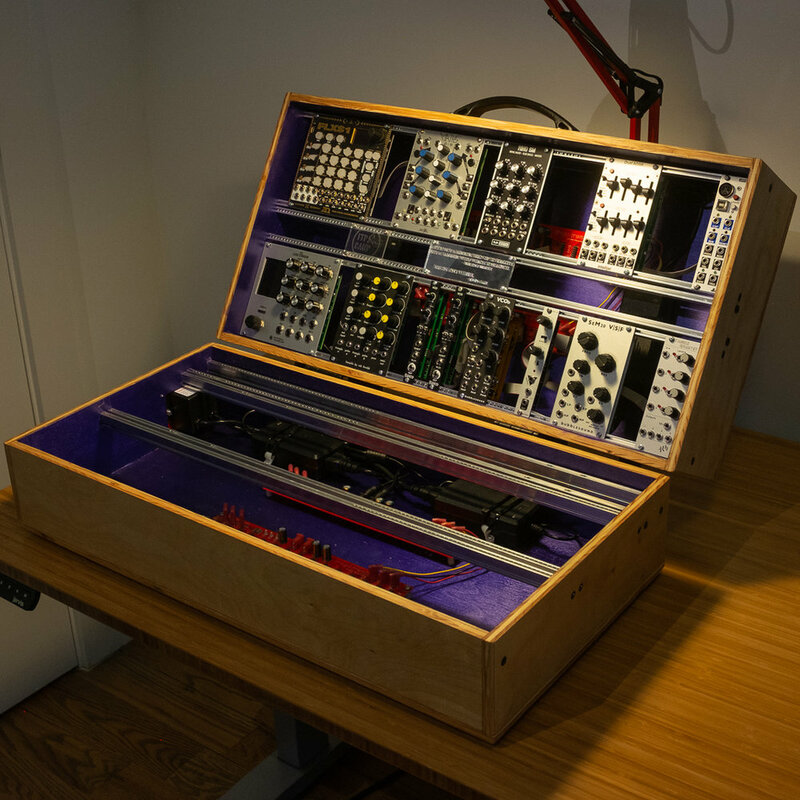 By summer of 2018, I’d filled my original case, the small three-tier case by Moog you see above, and so was looking at upgrading to a larger case. 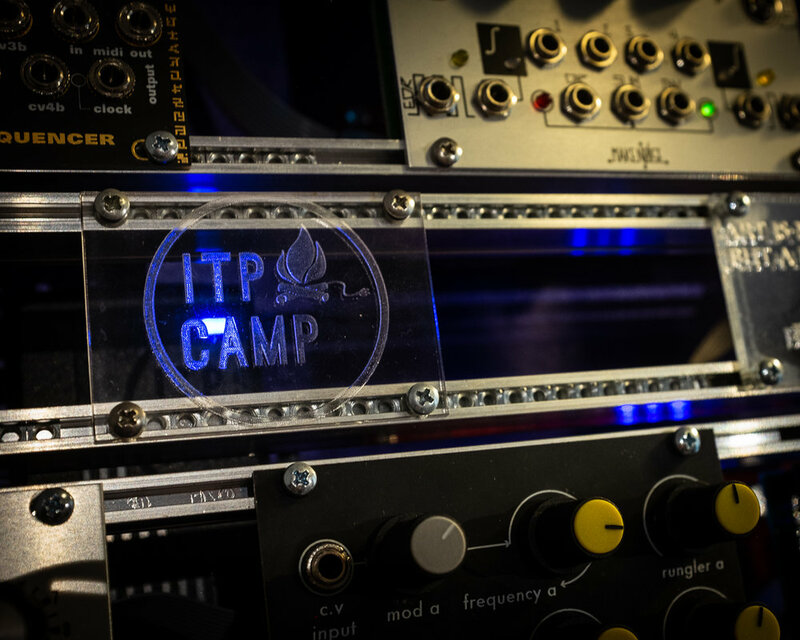 Reading a number of forums, I realised plenty of people build their own cases and, as I was at that moment a part of the ITP Camp for 2018, I had access to all sorts of soldering irons, power tools, spray booths, even 3D printers and a CNC router. Everything I would need to build my own case. It was a pretty slow process, with plenty of “I’m never going to finish this” moments, but in the end, I finished it in time for the end-of-Camp show and am super proud (and a little surprised) at just how well it turned out. I did make a silly error in measuring out some of the pieces and ended up needing to buy more wood…but that’s part of the learning process. Thankfully, a lot of my knowledge from building sets in high school came back to me as I worked through this project. 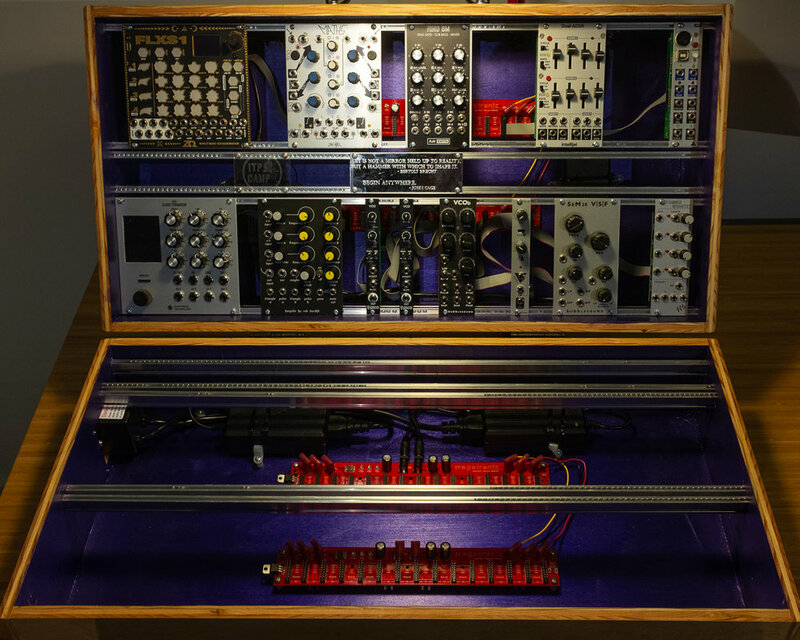 With my new case giving me more room, the next step, of course, was to buy more modules! Sequencers, oscillators, filters, envelopes - there are so many options! In August of 2018, a new piece with Theater Mitu, REMNANT, gave me the opportunity to play my synth in performance. I created a piece that sampled a recording of J Robert Oppenheimer quoting the Mahabharata, “now I am become death, the destroyer of worlds.” It was good practice to play the synth daily - I had never played the same patch more than once prior to REMNANT, and so I slowly perfected my performance: the timing, which hand had to go where, all the intricacies I never worried about before. Since August of 2018, I’ve kept going, though I’ve slowed down my purchase of new modules as I have many and the possibilities are already limitless. I love experimenting, playing around with “what would happen if I…”, and recording the results. I (try to) post short videos often to Instagram, showing whatever patch I’ve just made. It’s a perfect excuse to hone my video editing skills as well as putting out into the world the stuff I’m creating on a daily basis. A recent patch of mine from January, 2019. Lots of progress in one year!